The Science Conversation brings together students and faculty with a broad range of academic interests for a critical exploration of science within its historical, cultural, and social contexts. Sci Con encourages a philosophically and theologically informed appreciation for the development of science, the relationship between reason and faith, questions of meaning and purpose, and the complex interplay of science and society. It is designed to illuminate the distinctive character of science and its relevance to the challenges facing our world. The Science Conversation program is a sequence of three linked courses (fall, interim, spring) for sophomore students. 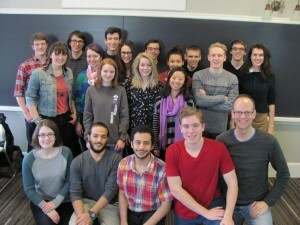 Each year, 24 students and 4 faculty participate. First-year students may apply in the early spring term. Each year, we seek applications from a broad mix of students, from art appreciators to book lovers to science enthusiasts, to create the next Sci Con cohort. The Science Conversation is open to all rising sophomores (current first-years), regardless of your intended major. Students who complete the program earn HWC, BTS-T, HBS, SED or IST, and WRI general education credits. Sci Con is a learning community, where students and faculty from a variety of disciplinary backgrounds come to know each other well. Participants bring their own disciplinary perspectives to wide-ranging discussions about influential ideas and readings from natural scientists, social scientists, philosophers, historians, and theologians. Science Conversation follows a ‘great books’ approach with seminar-style discussions. Primary texts by influential figures are read alongside secondary sources for analysis and overview. During Interim, students and faculty perform hands-on laboratory experiments while considering their intellectual and historical significance. In a broader sense, the Science Conversation seeks to help reunite the sciences and humanities, viewing the scientific enterprise in the context of the liberal arts.